The ninth of our top ten Australian day walks, Kangarutha Track is the highlight of the NSW South Coast on two feet and a heart beat. The NSW south coast is smothered in national parks – towns here are the exception not the rule – and coastal walking opportunities abound. Prime among them is the Kangarutha Track along the rugged northern shores of Bournda National Park. Beginning at Kianinny Bay near Tathra, the track meanders in and out of small bays etched into the rocky coast. The scenery is more dramatic than mellow, with barely a grain of sand to be seen until near the track’s end at gorgeous Wallagoot Gap. You’ll find it difficult to believe you’re about halfway between Australia’s two largest cities. Tathra, beside the start of the walk, is 450km south of Sydney. 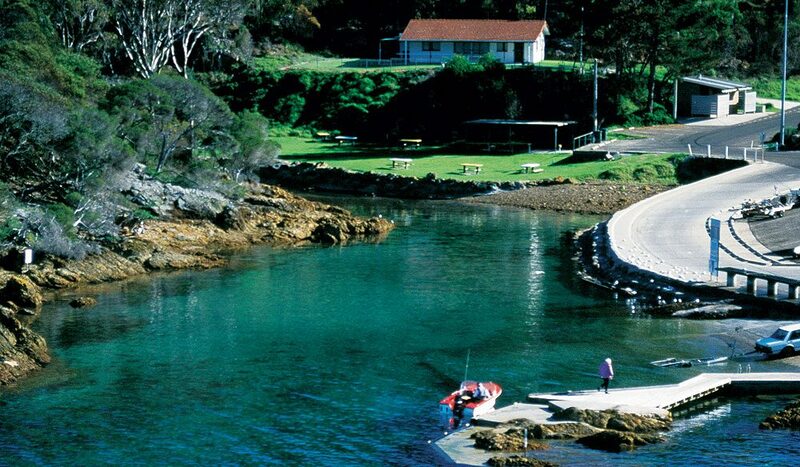 A rare piece of the NSW coast you can have to yourself, exploring hidden bays amid a wealth of wildlife. Wallagoot Gap, where the yellow beach is all but enclosed by rocky headlands. The only opening is the “gap” itself, where access opens and closes with the changing tides. If you miss low tide, look for the faint side tracks onto the rocks above the Gap. A fairly easy day of walking, with minimal climbs and short distances between bays.